If you've been enjoying Solatorobo: Red the Hunter over the past few weeks, you might have had chance to try out its free download content. There's more to come too, as Nintendo outlines the next month's quests available only via download. There's a new quest every week, with today's being the Air GP Pharaoh Cup for all those Grand Prix lovers, with future content exploring towers and special simulations, and all for nothing. As our Solatorobo: Red the Hunter review reveals, this DS adventure is one of the best DS games to have seen release in many a moon. It's due for release in North America in the coming months. 12th August 2011: Get ready to explore even more of the mythical floating islands of the Shepherd Republic as Nintendo launch four new quests for Solatorobo: Red the Hunter the new action adventure game which was made available across Europe on the 1st July 2011, exclusively for the Nintendo DS family of portable systems and which can be enjoyed in 2D on your Nintendo 3DS system. No NA release date yet? Sounds gr8. Can't wait 4 a NA release. ...That be great if we could have some of that fun over here. sigh Oh well. Hope the people across the Atlantic enjoy it . Amazon is listing the release date as September 27th, but I'm not positive if that's official. I thought that was it after the first four!! So cool and all for free!! This is the kinda DLC I can dig. Great game and the only reason I'm turning on my 3DS at the moment. I have seen this game at quite a few stores but I am going to wait for the NTSC version. Patience - it is worth the wait! And it looks good on the 3DS - even though it's not 3D. It's coming out September 27th according to Gamestop. I beat this game & it took me 30 hours to do, I had downloaded a couple of quests but only played one of them. Does anyone know if the quests get deleted every week? Or is it safe, say to just connect my DS to the internet after the 2nd of Sept. & get all the quests listed here? Thanks for the reminder though NL, I had forgotten that every week there's a new quest available... I have too many games! I have the first 4 missions, but I can't play them yet because I am not far enough into the game. Yes, it's a nice game with a awesome art-style. But it would have been better if it wasn't mission based, but more like Zelda with puzzles and maybe some platforming! 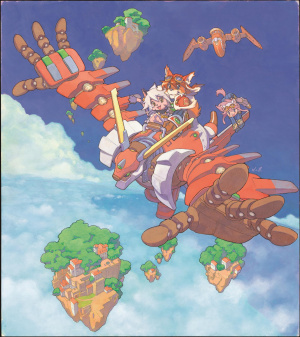 But it's nice though, and I hope that Cyberconnect2 also brings Tail Concerto to a Nintendo device. I would be willing to bet that sales of this game would increase significantly if it was available at online retailers other than amazon (who currently say they have one copy left). Wonder if these will be available in the US this game comes out.